Our Abpromise guarantee covers the use of ab74305 in the following tested applications. WB 1/2000 - 1/10000. Predicted molecular weight: 60 kDa. IHC-P 1/200 - 1/1000. Perform heat mediated antigen retrieval with citrate buffer pH 6 before commencing with IHC staining protocol. 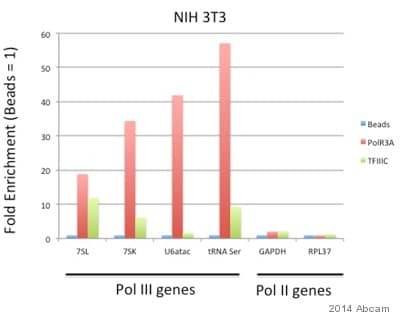 Involved in RNA polymerase III-mediated transcription. Integral, tightly associated component of the DNA-binding TFIIIC2 subcomplex that directly binds tRNA and virus-associated RNA promoters. Belongs to the TFIIIC subunit 5 family. Immunohistochemistry (Formalin/PFA-fixed paraffin-embedded sections) analysis of human breast carcinoma (left) and mouse teratoma (right) tissues labelling GTF3C5 with ab74305 at 1/500 (0.4µg/ml). Detection: DAB. Additional bands at: 90 kDa. We are unsure as to the identity of these extra bands. 20% of immunoprecipitate obtained from 1mg HeLa whole cell lysate using 3µg ab74305 or a control IgG was loaded in lane 1 and 2 respectively. 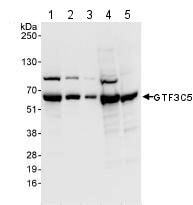 GTF3C5 was then detected by WB, using ab74305 at 1 µg/ml. Detection: Chemiluminescence with an exposure time of 1 second. ab74305 has not yet been referenced specifically in any publications. Publishing research using ab74305? Please let us know so that we can cite the reference in this datasheet.